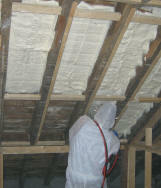 Condensation prevention is one of the most widely used applications for sprayed foam insulation. Sprayed foam insulation is used to prevent condensation in buildings and even on boats and motorhomes. Condensation occurs when moist air comes into contact with a cold surface. This can be a wall, a roof (particularly metal structures), tiles etc. For condensation to occur on a surface, the surface temperature must be below the dewpoint of the air. The dewpoint is the moisture carrying capacity of the air at a given temperature. Condensation can cause problems if provision is not made to either prevent it happening, or to remove it where it occurs. How do I prevent Condensation Occuring? Moisture removal is the method most commonly used in areas of high humidity like bathrooms and kitchens i.e. extractor fans are routinely fitted, and have become mandatory in new builds. 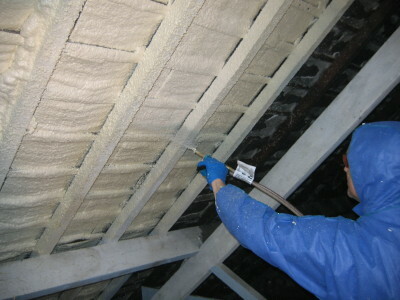 Insulation is widely used to prevent condensation occuring. Insulation helps prevent excessive heat loss from the building and this in turn means that the internal surfaces will be warmer (warmer than the dewpoint of the air inside), thus preventing condensation. Ventilation is used where condensation may occur e.g. lofts and roofs, and allows condensation to evaporate and be removed from the structure naturally when the outside air temperature is warmer. Ventilation is obviously an unsuitable way to prevent condensation in lived-in spaces because of comfort levels. Generally speaking, most buildings incorporate a mixture of all three methods to prevent the build up of condensation. 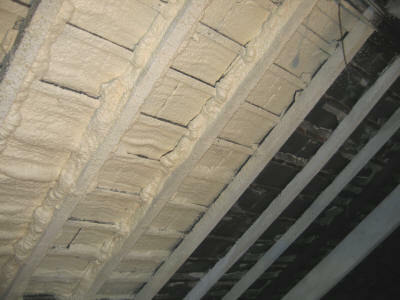 Where does Spray Foam help?